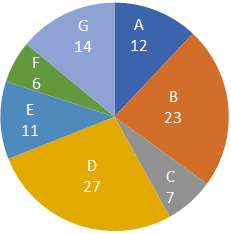 Directions : Study the following pie charts carefully and answer the questions given beside. In a hockey tournament, total of 500 points were scored by 7 players in two matches together. The total points scored in the first match was 50% more than that of the second match. 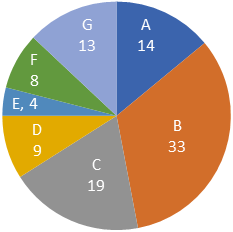 The pie chart 1 and pie chart 2 gives the information about the percentage breakup of the points scored in the first match in the second match respectively. Which of the following players had scored the least number of points in the two matches together? The total points scored by B in the both matches together was what percent of the total points of both the matches together? In the tournament, the highest number of points scored by any player was how many more than that of lowest number of points scored by any player? What is the ratio between the total number of points scored by the player A and that by the player G in the both matches together? The number of points scored by A and B together in the first match was how much more than that by F and G together in the second match?